Awhile back my good friend Esther asked what I’ve been eating now that I am on the road full time. Maybe she was asking because of the new announcement about her and Jacob. They are going to be living in an Airstream (so dreamy!) for their next adventure. While Esther and Jacob are learning the ropes, I’ll share what our meals look like. The morning doesn’t start before I have my double cappuccino. My Nespresso machine (along with our rice cooker) is one of the few appliances we brought with us. My Nespresso machine and rice cooker. I also calculate how many coffee capsules I need on each leg of our trip and buy them ahead of time to store in our cargo. As for what we eat in the morning, it’s usually pretty simple. We buy several packages of gravlax (thin slices of cold smoked salmon) from IKEA and keep them in our freezer. We eat one package a week, sometimes more depending on what we are doing during the week. We put that gravlax on a toasted bagel with cream cheese (mustard for the hubby) and capers. When tomato season comes, I’ll add a slice of tomato. Most of the time we wrap this up in tinfoil and take it for the road. Each package gives us three bagel breakfasts. If we are eating it in the RV, I’ll add grapefruit or orange juice as well. That’s our go-to breakfast but if you let me, I’d eat eggs every day! Mr. Misadventures makes killer scrambled eggs (it’s in his French DNA) which we eat with toast. We do the same with fried or poached eggs. From time to time we’ll do yogurt and granola, but both the granola and the yogurt we’re finding on the road is too sweet, so I don’t eat it as often as I did before the RV. When I have them, I also like whole wheat frozen waffles, but the hubby doesn’t like them so I eat them when he goes out for sunrise shooting without me. Lastly, I also bought a container of grits, but I have just been way too lazy to make them (full confession). Nine times out of ten we eat lunch on the road. We prep sandwiches: tuna salad, egg salad or turkey. Or we prepare pasta salads ahead of time and bring them in our cooler in the back of our Jeep. The pasta salads are either macaroni or orzo and we put in a variety of things: celery, cucumber, artichoke hearts, sun-dried tomatoes (or fresh tomatoes), black olives, eggs and tuna. Sometimes if we have left over soba noodles (see dinner) we’ll throw in some sesame oil, furkake spices and soy sauce and eat that. On cold days we’ll bring a thermos is miso soup as well. If we are stuck inside because of weather or fatigue (going from sunrise to sunset for several days in a row can catch up with you) then we will steam tamales that we picked up in Tucson along with refried beans, or we’ll steam some Trader Joe dumplings. Warmer days we’ll have pasta salad, cottage cheese or open a can of sardines. Colder days we’ll make clam and seaweed miso soup that we brought home from Kyoto or hit soba noodles. All depends on weather and availability of fresh veggies. If it’s nice outside we’ll BBQ sausage (chicken or lamb); lamb (we bought a whole bunch in Santa Fe) or salmon. We’ve also done steaks twice and hamburgers twice. We are not big beef eaters so it’s only every once in awhile. We’ve given up on chicken except for sausages because it always seems to get overcooked. Along with that we’ll BBQ whatever fresh vegetables we can find. This winter that’s been zucchini, squash, eggplant, the occasional corn on the cob. We’ve done portobello mushrooms once and yams a couple of times. Looking forward to some different vegetable choices soon. We finish the plate with steamed rice or sometimes we just eat the protein and veggies. 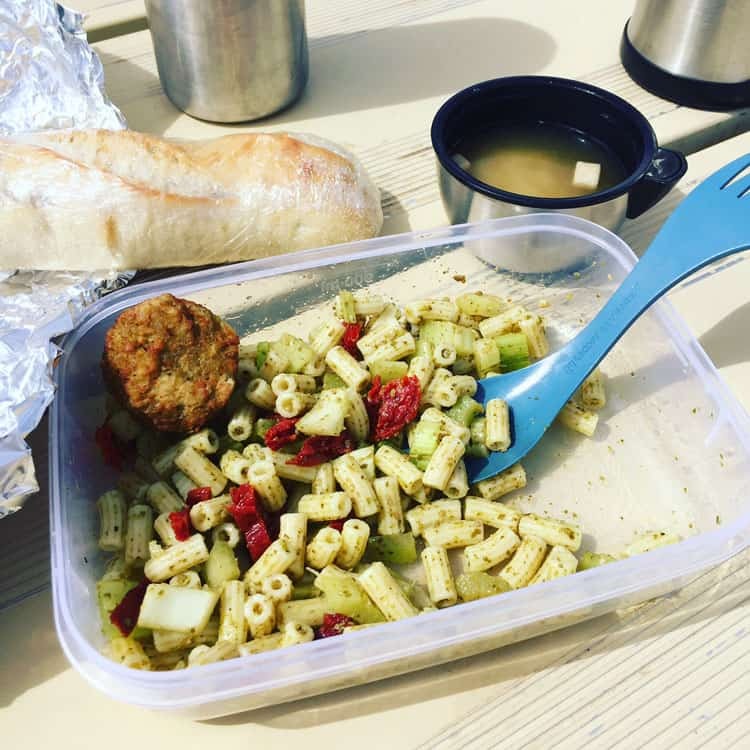 On cold days or if we are staying at an RV parks that don’t accommodate bbqing, we don’t want to smell up the RV by cooking meat or frying anything so we’ll make pasta with vodka sauce that we eat with chicken meatballs from IKEA, or we’ll just eat the pasta with butter and soy sauce. We also have vegetable meatballs from IKEA that we’ll eat with rice. Or a frozen vegetable stir fry from Trader Joe’s over rice. We’ll make soba noodles with fish cakes, frozen shrimp and spinach, sometimes with a poached egg on top. For a special treat we’ll open a can of Comtesse du Barry either cassoulet, confit de canard or pintade with mushrooms. 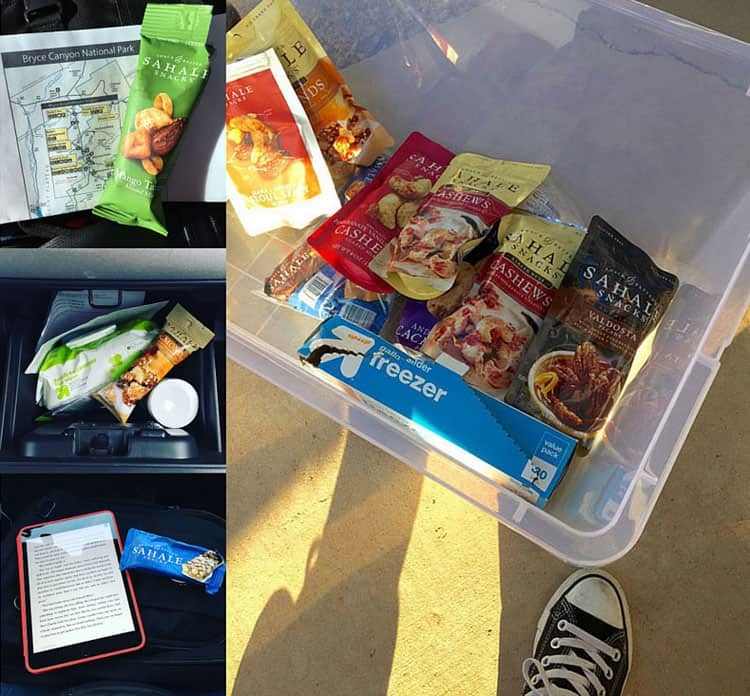 I carry Sahale Snacks every where: in my backpack, in our cooler, in the glove compartment, in cargo and in our cupboard. Depending on my mood I’ll go for more salty or sweet. We eat a lot of hummus, pistachios, plantation chips and dark chocolate. I bought a couple pounds of bulk black licorice pieces from IKEA. I eat a few pieces almost every day. I also buy the big boxes of Swedish cookies from IKEA and put 6-8 in plastic bags which I stick in the freezer and dole out one of those a week as a treat. The hubby has a yogurt every evening, I’ll have one once a week or so. We drink a single coffee in the morning and juice. The rest of the day it’s lots of water, both still and sparkling, some coconut water and lemonade. If I can find, but it’s super rare, I’ll drink aloe water or juice as well. We’ve got wine, beer, champagne, cognac, eau de vie, Jim Beam apple and vodka for salty dogs (thank you Jim!). 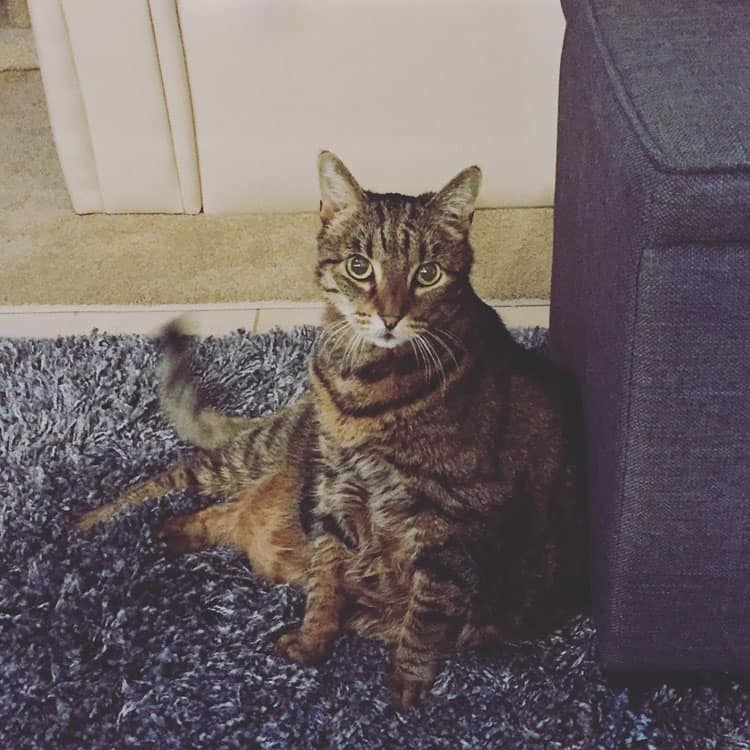 Jessica is just as gourmand as we are, so before I left San Francisco I bought an outrageous amount of her organic canned food which I give her with pumpkin. She also drinks lots of cold water, if it ain’t fresh she ain’t drinking it. You asked and I gave. Maybe with way too much detail, but once you get me started on food, it’s hard to get me to stop! I am positive there will be adjustments based on seasonality and location so I’ll update you again in the coming months. What do I really miss when it comes to food? Good bread, specifically Acme. Sushi. Dungeness crab, we missed the whole season in San Francisco (Nov-Mar). Asian food in general. Limitless avocado and tomatoes. Cold press juices. How about you? 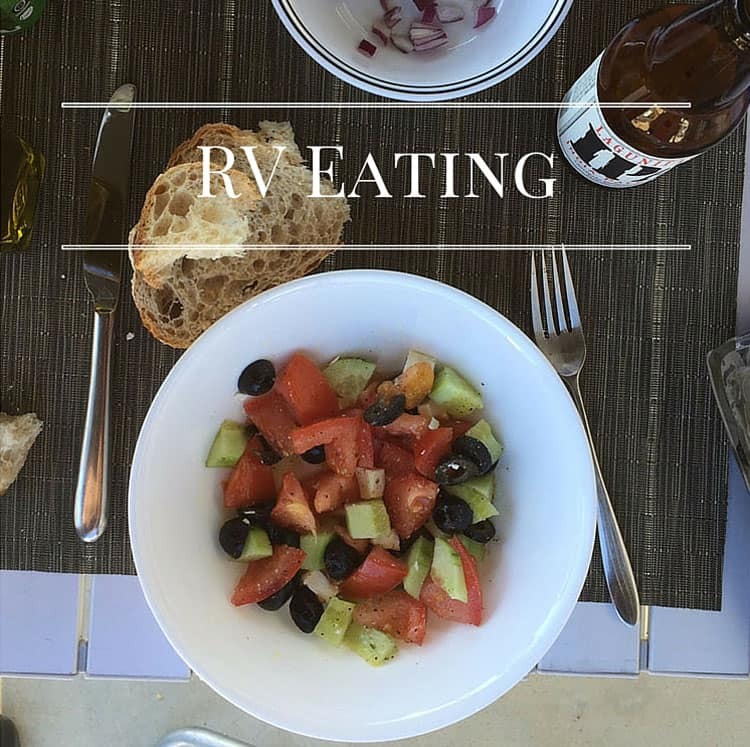 What kinds of meals do you make on long trips or camping trips? When you travel away from home, what do you miss? You sound like you eat better on the road then I do at home! 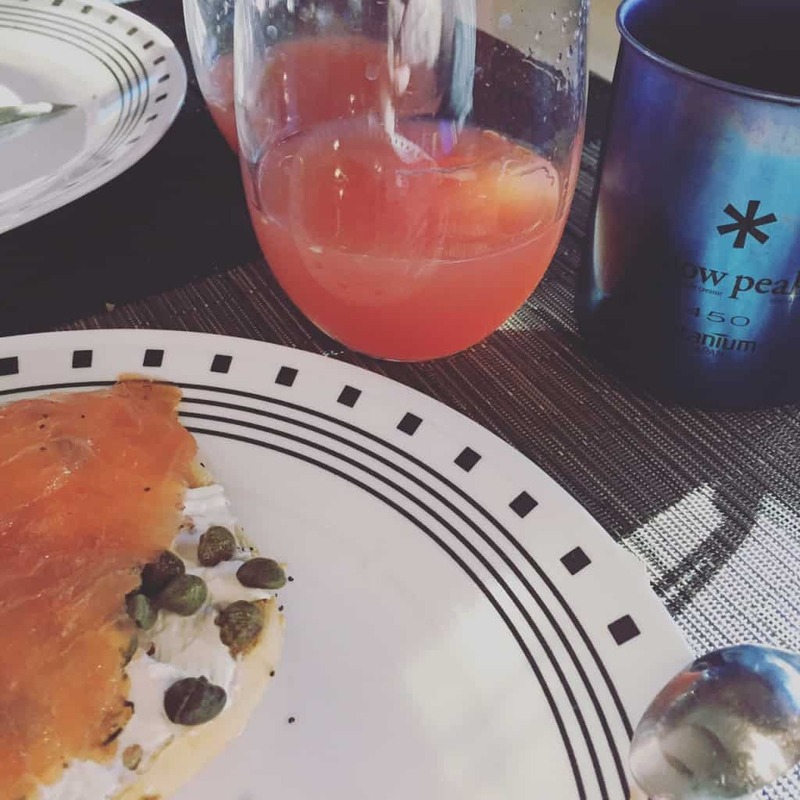 Bagel, Lox and cream cheese–yummy–Since I eat in most of the time I generally make some kind of protein (meat) and veggies and leave it at that. If I eat lunch out-depending on my mood-I will either eat what would normally constitute a dinner (I don’t eat dinner those nights) or go light–a slice or two if good old NY Pizza!! You have no idea how much I love that you took your Nespresso and a rice cooker along in your RV. It’s so good to know you can maintain a high standard of eating even while you’re on the road. This might be dumb but does the RV have an oven?? If so you can easily make your own granola. I make mine all of the time and the boxed stuff tastes so bland in comparison! Sounds like you eat better than we eat most days! I love eating fresh fruits and veggies but they are so expensive here. The cucumbers and tomatoes look amazing! One of my favorite things! I would love to do that some day. That sounds like so much fun! 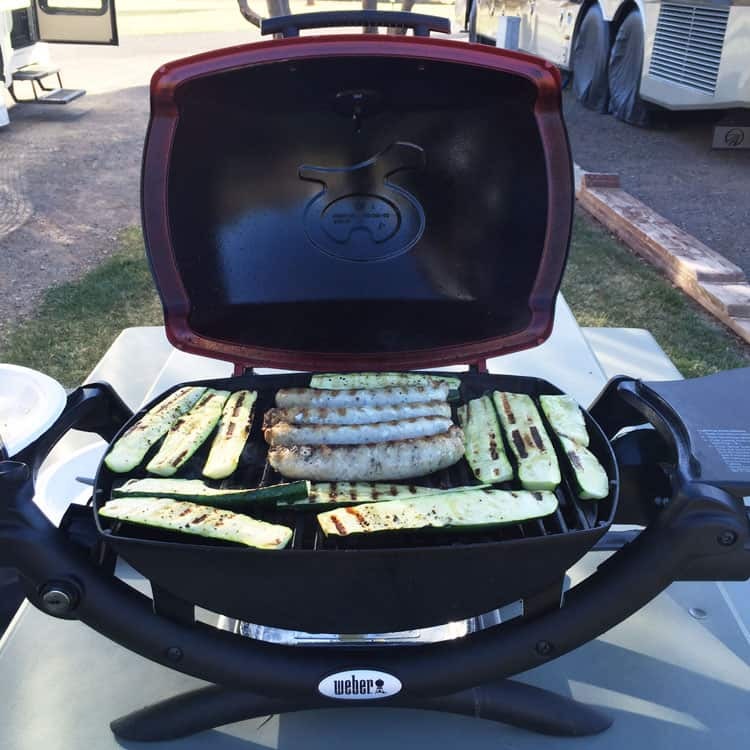 You guys are eating amazing for being in an rv!! I love that you guys are still sticking to a good diet while on the road like this. Wow I can’t get over how beautiful the inside of the RV is. Better than some regular kitchens I’ve seen. 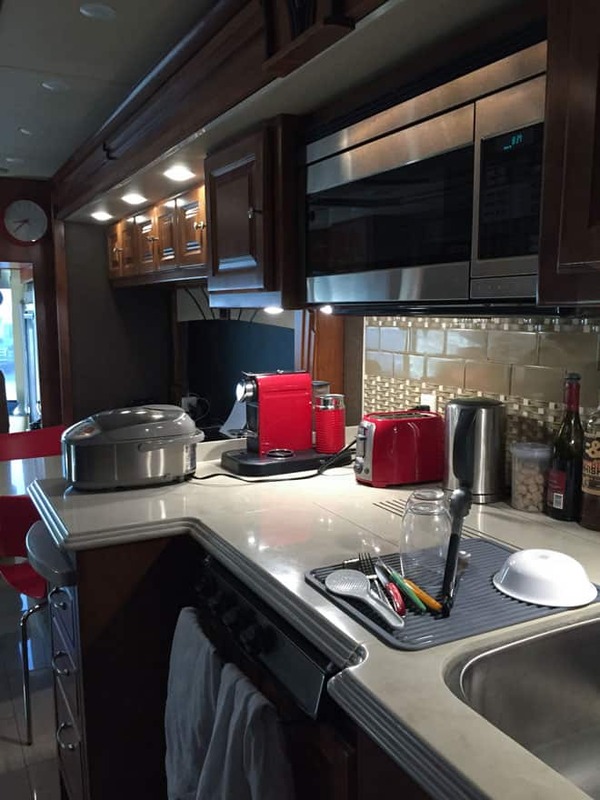 First of all that RV kitchen is nicer than my home kitchen! So lovely. The food looks amazing, I could travel around like this – I could live like this! I’m so impressed with how you’re pulling this off and being so healthy. I’m totally inspired. Your food is so healthy and delicious! It’s so good that you are doing well in preparing food. 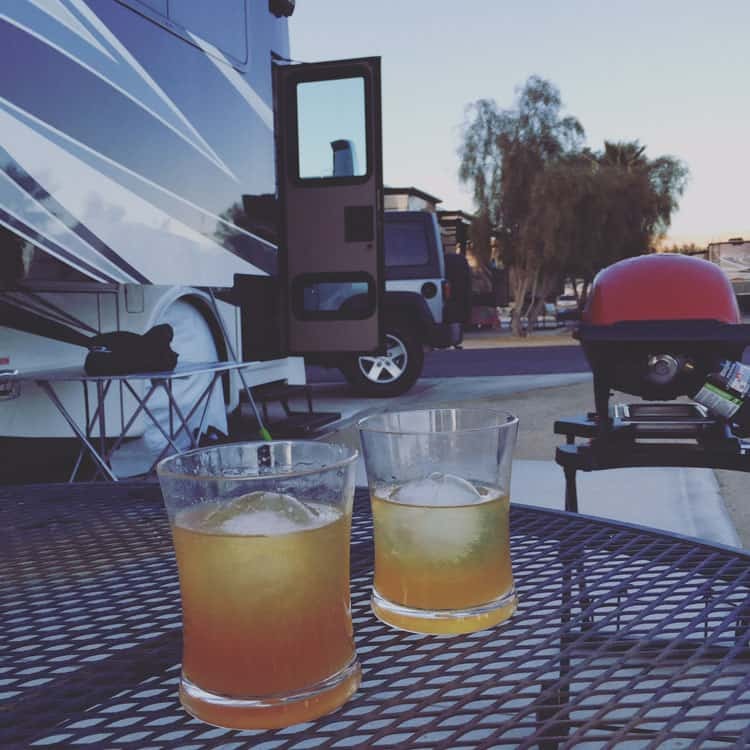 I’d love to have a RV and travel with my family. Love you menu ideas, looks delicious and a lot of fun! I love the idea of the Nespresso machine for making cappucinos. One of the challenges of being on the road is to not stop to buy coffee and meals, so making your own good coffee is both convenient and a way to save money. I love your RV kitchen, btw. Looks really nice! So many delicious and healthy meals. I need to get myself on more of a healthy eating habits!